There is no doubt, Sunnyvale has been tremendously influenced by developers and special interests. It is VERY IMPORTANT to elect grassroots candidates who will listen and work for residents. All three recommended candidates have been long time residents of Sunnyvale and have extensive experience serving in different capacities and are supported by individuals who overwhelmingly live in Sunnyvale. 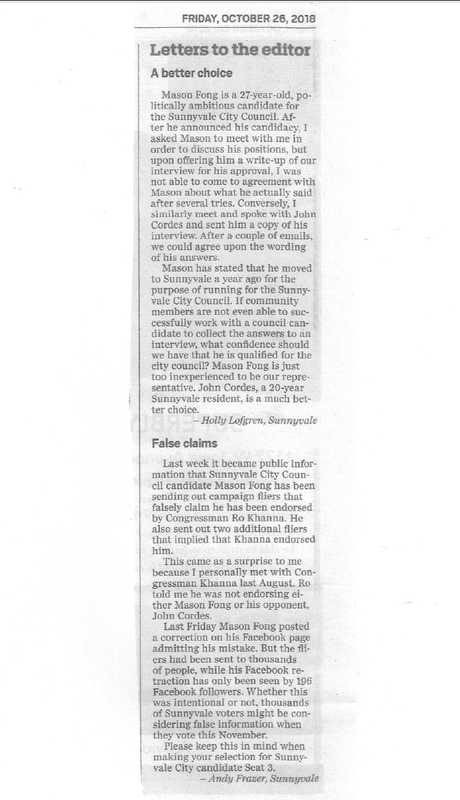 Additionally, the Sunnyvale Sun published an Op Ed from both myself and Andy Frazer outlining why candidate Mason Fong is unsuitable for this public office, dated October 26, 2018. 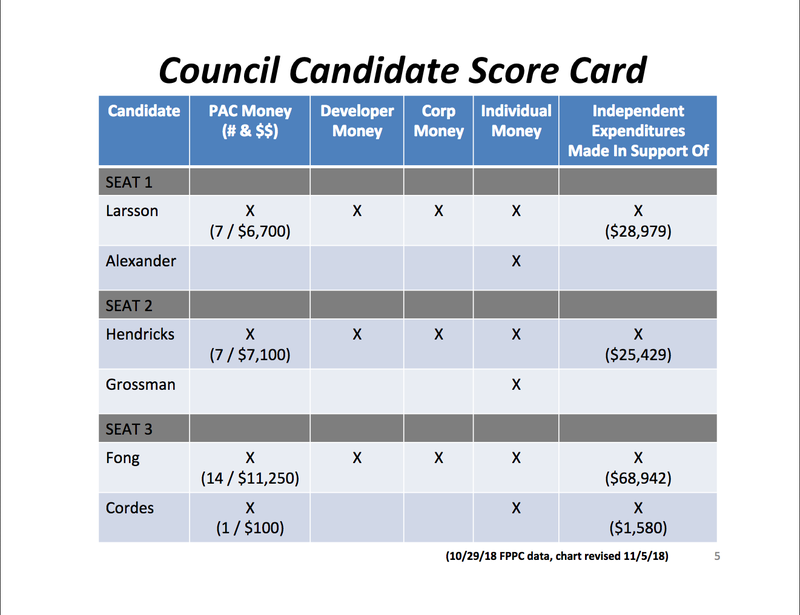 Why would Corporations and Developers, who live outside of outside of the City of Sunnyvale, fund certain Candidates for the City Council Election 2018? Why so much Campaign Funding? Do large contributions make for a better Candidate? This does not mean that the highest funded candidates are the best choices . 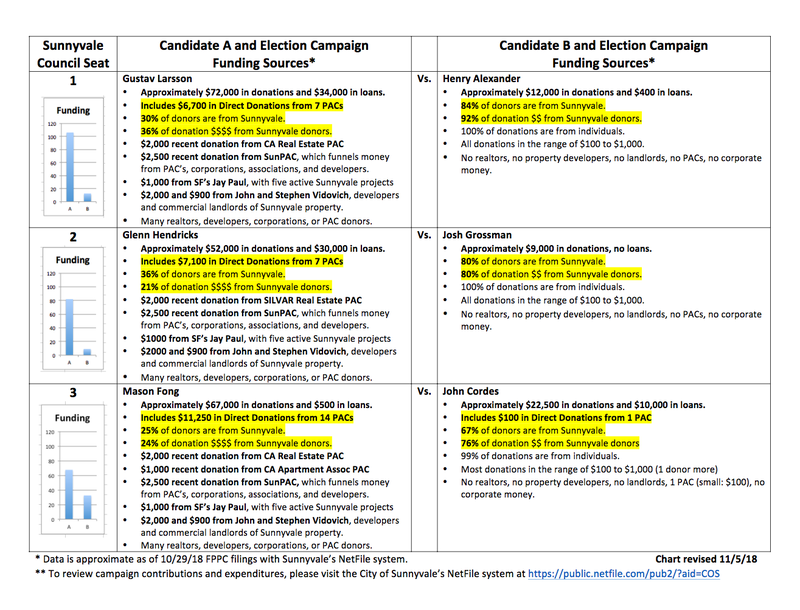 . . the generous campaign donors ultimately desire a City Council and Members who will vote favorably to approve their developments and projects. This is not always in the interest in the quality of living for Sunnyvale Residents. Overwhelming Funding is NOT EQUAL to a BETTER CANDIDATE. Talk with the Candidates, visit their websites and remember you are the one who elects the Sunnyvale City Council. Remember to VOTE ON Nov. 6th !! ADVOCATING for Sunnyvale, VOTE for Henry Alexander III, SEAT 1, Sunnyvale City Council on November 6, 2018! Watch Henry’s presentation provided to the Sunnyvale City Council to see how he researches, explores, reviews, and then carefully delivers a beneficial solution. This is the type of Candidate who is well-suited to being an excellent Council Member. Worked at major tech companies such as Facebook, Google, Western Digital, and Seagate which gives me a current view of today’s technology and “Move Fast” culture. Adjunct professor at Cogswell College in both the Business Arts and English/Humanities degree programs. Has taken the role of spokesperson and leader in the neighborhood he lives in and surrounding communities in Sunnyvale. He has helped plan several outreach events to help strengthen the bonds within the community and to promote connection. Henry has emerged as the City’s point of contact to communicate with the community at large. He has hosted extremely well-attended forums which have included Mayor Glenn Hendricks, Sunnyvale DPS, and City Traffic staff. Led initiatives such as “Save Raynor Park” as well as “Adopt a Park” which mobilized over 1,000 residents in less than about a week to obtain petition signatures to save open space. Served as the mentor for numerous high school students as leader of the Generation Xample music program. Make your VOICE Heard and Vote for HENRY on Nov. 6th !! Dear Sunnyvale Residents, this is a reminder that the City of Sunnyvale Council Final Hearing for Butcher’s Corner is tonight, Dec. 13, 2016 at 7:00pm. You are encouraged to attend and speak. Be sure to get your “Don’t Butcher the Corner” sticker as you enter. Where: Council Chambers, 456 W Olive Ave between S Mathilda and S. Pastoria Ave. The proposed Butcher’s Corner Project includes 99 apartments (6 and 7 story) as well as 39 3-story townhomes, significant and unavoidable traffic impacts at Kingfisher and Fremont, and includes deviations for EL Camino bldg front set-back, Fremont Ave front set-back, and reduced distance between buildings. The Sunnyvale Planning Commission recommends a new traffic study, the Heritage Preservation Commission recommends that 6 trees be named Heritage Resources, the Stocklmeir school is grossly overcrowded and many, many people object to this project for a host of other reasons. Topics to speak on – the inadequacy of EIR, or the many issues relating to the project as a whole. There will be only one hearing and one opportunity to speak. Speakers have 3 minutes. Visual aids are allowed, such as PowerPoint or PDF files. We are expecting the developer to bring lobbyists and high density development enthusiasts, so it is very important that the residents stand up for their community and reasonable development. Deborah Marks approaches City of Sunnyvale Council and public meeting on October 8, 2013 regarding the nodes along El Camino, particularly at Mathilda. Marks recommends design standards and landscaping to avoid the Urban Canyon effect. With a PowerPoint presentation, Deborah advises the setback at nodes to be 15′ with 1 story at the corner and 2 to 3 stories progressing inward from the corner and provides examples. Candidate Steve Hoffman is running for Sunnyvale City Council Seat #2 for the benefit of the residents of Sunnyvale. Sunnyvale does not have Districts; therefore, voters will vote for each seat on the ballot (Seat 1, 2 and 3). Steve Hoffman is a bright, patient, articulate, knowledgeable, solution-oriented and most importantly – an accessible man who demonstrates ethical behavior with integrity. In fact, he has been attending the Sunnyvale City Council meetings for years providing public comments and offering brilliant suggestions to benefit the citizens of Sunnyvale.